During this holiday season, while armies of eager shoppers packed malls and stores throughout the nation, America also joined in the festive atmosphere, giving expensive gifts to many of its friends and associates. You might be wondering what is hiding underneath the wrapping paper? If you guessed weapons, you are spot on. Yes, that’s right, there is no better way to say “I love you” than to give your ally a 2,000-pound bomb that can be used to greet their next-door neighbor, say, in the Gaza Strip. According to government reports, the United States military uses approximately 1.8 billion rounds of small arms ammunition a year. We know then that the Military-Industrial Complex leaders and corporate executives are having a very Merry Christmas. Better yet, while American children track Santa Claus via NORAD, you know, the same system used to track Russian Intercontinental Ballistic Missiles (ICBM’s), American bombers and drones are patrolling the skies alongside him. Well, Santa Claus visited what seems to be every nation on Earth spreading good will and oh yes, Western capitalism. 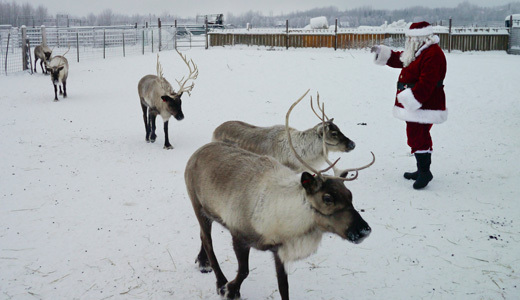 Santa Claus also paid visits, according to NORAD, to nations like Yemen, Somalia and Pakistan. I wonder if he dodged all the drones spreading their gifts as well. So tell me, what is this season all about? What is this holiday spirit we are teaching to our youth? While many Americans enjoy the company of family and friends along with the materialist cornucopia that lies beneath the Christmas tree, many more Americans will be going to bed cold and hungry in substandard housing, fearing the economic specters still haunting them. I wonder if anyone looks at the tags or labels on their Christmas gifts. Can one fathom the working conditions where the consumer goods were produced? Maybe the clothing bought at Wal-Mart was made in Bangladesh, where workers are treated like chattel, forced to work in horrid conditions, which has resulted in the death of over 100 factory workers in recent weeks. Where is Wal-Mart, who greets its consumers better than its workers? Karl Marx wrote in Capital Vol. I, “A commodity is therefore a mysterious thing, simply because in it the social character of men’s labour appears in them as an objective character stamped upon the product of that labour…” Thus, the social relationship consumers and producers have is presented in the form of the commodity which alienates the one from the other. Therefore, when children this season open their gifts, they see the object as it is, without seeing the labor, the working conditions and the hands that built, packaged, shipped and delivered the product. What does “Made in China” mean? The mode of reflection should be redirected to who made it in China and what their standard of living is. It seems that Americans are further disconnected than ever before from the growing inequality that surrounds us. While the superrich enjoy gated communities, private transportation and the most exquisite cuisine, approximately 20,000 people will die on Christmas day from hunger or hunger-related issues according to the United Nations. For such an emotionally charged season, few people care to address the structural inequality around the globe today. Even fewer know that major corporations have been purchasing large tracks of land throughout Africa and the nations which comprise the periphery, in a move dubbed “Land Grab” as reported by the Oakland Institute. While we send more aid and food to the regions struggling with perpetual war, disease and environmental issues, multinational conglomerates seize the opportunity in the midst of discord, to buy land that will be converted to produce vegetables and raise livestock for export. Yes, corporations are buying land in nations that have chronic poverty and war to grow crops and livestock for the global market. These moves have displaced tens of thousands of villagers, forcing them from their traditional homes and ruining local agriculture. This renewed economic colonialism seeks to destroy the infrastructure of a continent already deeply devastated by the AIDS pandemic, poverty and war. We the working class must show them what giving is all about, organizing our workplaces, fighting on behalf of the poor and the marginalized as well as fighting racism, sexism and LGBT violence that have been institutionalized by the hetero-patriarchal capitalist order. We must fight for peace and demilitarization both at home and abroad, focusing our efforts on rebuilding our nation, the environment and improving the international labor force. That is how the working class should feel empowered. Whether you are religious or not, the holiday provides an opportunity to be with family and friends, to build relationships of love and solidarity and to continue to fight for justice, equality and a brighter future. So what should we be teaching people, most especially the youth about the holiday season? That the season for giving means much more than spending our days wasted in stores shopping endlessly for presents while Christmas music plays in the background. The season means redoubling our efforts at fighting for structural changes both at home and around the global. It means creating a more equitable society and international community where the experiences and fears of war, poverty and disease can be alleviated. It means being thankful for the ability to have a voice and to work hand in hand in movements of solidarity and freedom alongside rural farmers, industrial laborers and the technicians that embody human labor and ultimately our progress as a species. Most of all this season, we should be grateful that we have another year to give to the struggle for building a better world.